Sometimes I fall in love with things — to the point of obsession, or, as the hubby would say, to the point of stupidity. 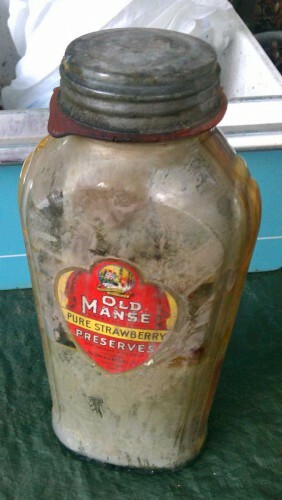 *wink* Today’s example is an old preserves jar. I knew that whatever was in this old glass jar was not a “good thing,” but somehow the metallic silver tone still sparkled and beckoned from behind the decorative molded glass. Look how the caramel-colored whatever-it-is seemed to flow along the inside of the smooth art deco lines! And who doesn’t love the dear Old Manse paper label on the front?! So I snapped it up. Hubby once again admonished the purchase, saying we should toss it out in the garbage. As if! I was too smitten. 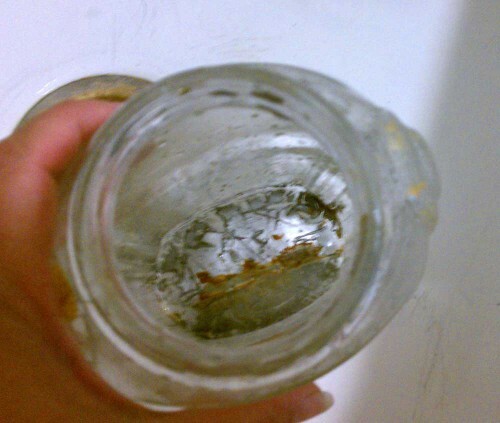 So I took the old glass jar home and proceeded to clean it out. First, I tried to remove the lid. But it was firmly adhered to the red rubber seal — and the red rubber seal to the glass. So I proceeded to gently but firmly tear along the rotting edge of the jar’s lid with an old house key. Just a bit a first, so I could pour out the stinking liquid. It didn’t drain this old bottle as much as I’d thought. Thinking the more solid pieces were preventing proper drainage, I went back to continuing to tear at the old lid. It was pretty soft with the rot, but when I hit an area which was too tough I did enlist the husband’s help to finish prying the lid top all the way off. Eventually we effectively scalped it, leaving the red rubber seal and rim of the lid intact. This fully released the Kraken of smell. Ugh. There still was not a lot of liquid to pour out. In fact, most of the whateveritwas was as stubborn and stuck to the glass as the seal and lid. Given the approximate 2 and 1/2 inch opening of the jar, I had to be careful working with the ripped-off lid and what remained of the rough, sharp edges. We used a pliers to peel off sections of the old zinc lid and rubber seal. Next, I had to try several different things to try to dislodge the gunk. I tried a pair of tongs, but whatever was in the center was as strong as a human tongue — and had roughly the same texture. 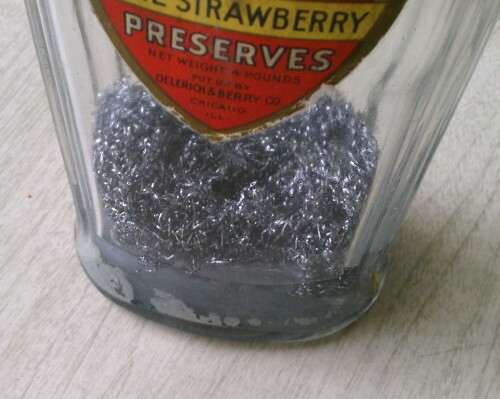 Only it, and the entire jar, was covered in that metallic silver stuff too. Silver stuff that just didn’t scrape off. Not even with the business end of a steak knife. I stabbed a few holes and slits in the center “tongue” and filled the jar with a mixture of bleach & water and let it sit. Several hours later, no change; so I repeated filling the jar with bleach water and let it sit over night. 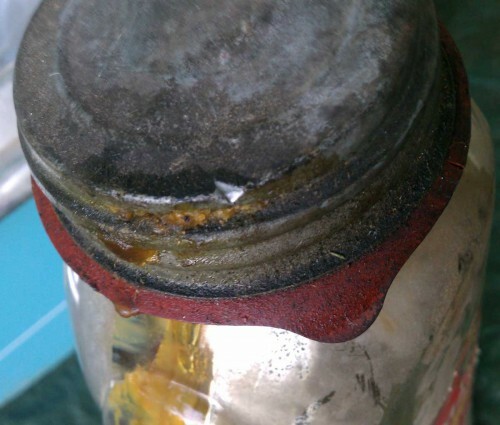 While hubby and I had initially thought that was that this was just a bottle of rotting preserves, the silver stuff a result of some sort of rotting chemical reaction with the old zinc jar lid; but after a few attempts to dislodge the stuff it became clear this was unlike anything I (or you!) could imagine. Well, I too was not so much interested in the smelly gunk as I was the old glass bottle. 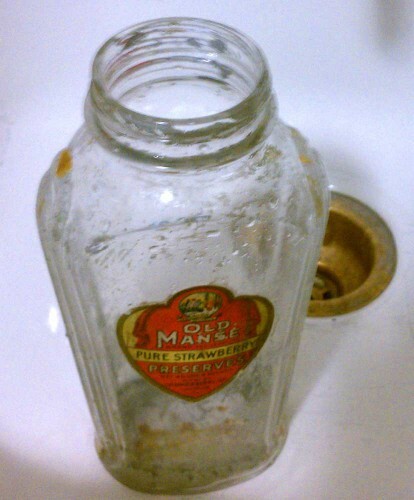 But, unfortunately, this was a mess I had to deal with — if I wanted to salvage the bottle. And I did! Over the next few days, I continued to literally chip & tear away at the physical problem. 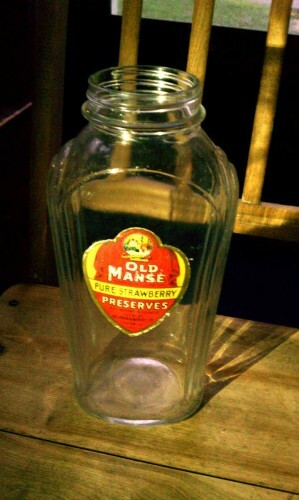 What makes this vintage glass jar or bottle so beautiful is exactly what makes it so hard to clean! The art deco lines, the rounded shoulders, the way the glass bottle narrows to the bottom — these were all difficult to clean. I sat for hours, wedging my hand into the mouth of the jar, carefully chipping, scraping, tearing, and cutting at the stuff inside. I used steak knives, tongs, and an old bread knife. (The bread knife, while it unable to cut anything anymore, had a long, slightly curved blade with a wide, rounded, blunt end which could reach areas of the molded class that other things could not). I alternated between the “tools” and using the “tools” to employ the power of Chore Boy scrubbers by leveraging the scrubbing pads into the glass. And, boy, were my hands sore from all the unusual dexterity! I had a very small space to work in, to apply pressure in, while my other hand held the bottle securely. In between scraping sessions, there were soaking sessions too. I made progress. But it was far from clean. 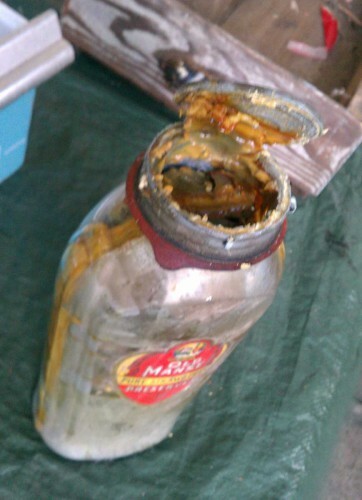 At this point, hubby was convinced that what was in this old glass bottle was old model paint. 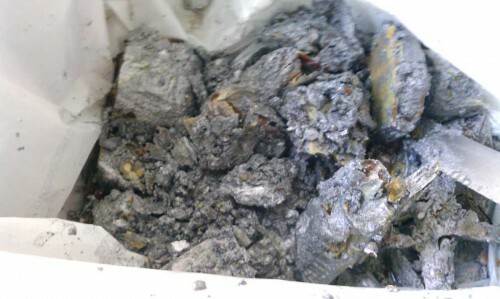 That would explain the large quantities of metallic silver, if not the hard waxy stuff. So I began to apply mineral spirits. It helped. But it sure was not the quick fix one hoped for, not even after I had manged to tear-out, chunk by chunk, that thing I called “the tongue”. I continued to alternate scraping with soaks and rinses. Not only using the mineral spirits, but with other cleaning products (including dish soap, standard kitchen spray cleaners, and CLR), and, of course, lots of hot water. Often I would fill the bottle about half-way with my fluid of choice and, with my hand over the mouth of the bottle, swish and swirl the liquid around. Sometimes I left the Chore Boy in for a bit more help. I hoped. 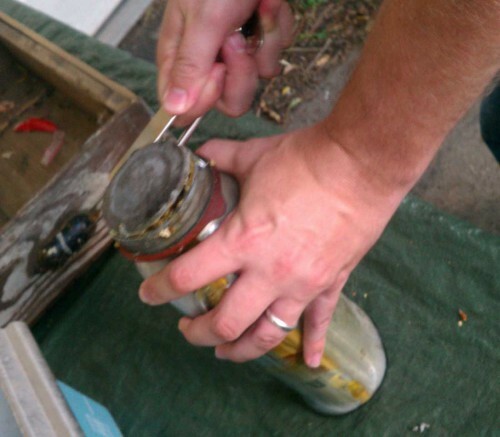 It may surprise you, but that swishing actually did break off some of the stuff that lay at the bottom of the jar (in the crease where the bottom joined the sides of the jar was especially hard to fiddle any “tool” into). All the chemicals aggravated my skin, of course; but I didn’t trust gloves to hold the glass securely. And there was no way I was going to break this jar! Not after all of this! Plus, I had to do all this while trying to preserve the old paper label. Eventually, bit by stinking bit, I did get the jar clean. 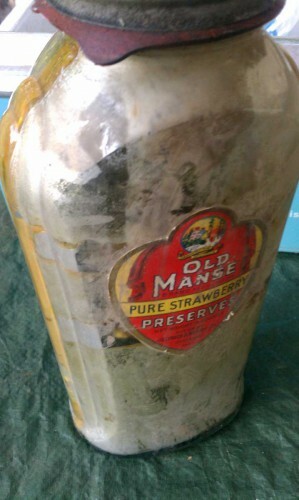 Probably not clean enough to preserve any food in, mind you; but good enough to meet collector standards. And without any chips to the glass itself, and minimal wear on that beautiful label. Isn’t she a beauty?! I just knew she would be! Now, the only question hubby has for me is, am I going to sell it? UPDATE: I am selling it here. 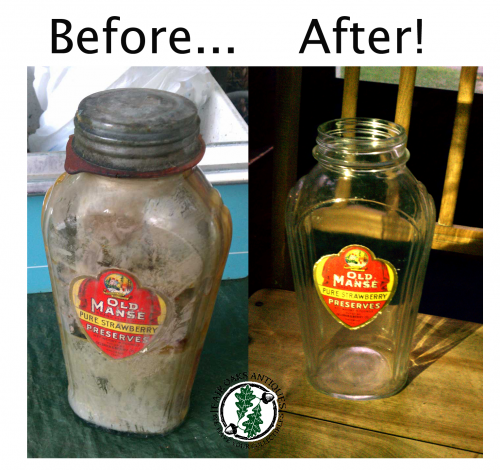 4 Responses to "Preserving The Integrity Of An Old Glass Preserves Bottle"
Enjoyed this cute little “labor of love story.” Sounds like something I would do. She is a beauty. Tanks for sharing. Thanks for reading, Donna! Do you collect bottles or anything else?